My laptop messenger bag is basically my mobile office. I take it with me whenever I leave the house for anything more than a trip to the grocery store. The contents of that bag let me quickly get to work anywhere I am, any time I want – and that gives me a lot of personal and professional flexibility. Reflected in the bag, though, are several aspects of my frugal sensibilities. Most of the items in the bag, in fact, cost me only pennies. My biggest strategy is to look for useful freebies – things that are extremely inexpensive or free replacements for items I might otherwise pay for because they clearly fill a use. Several readers have asked for a tour of the bag, so here goes. I hope you find some tips and tactics that are useful. 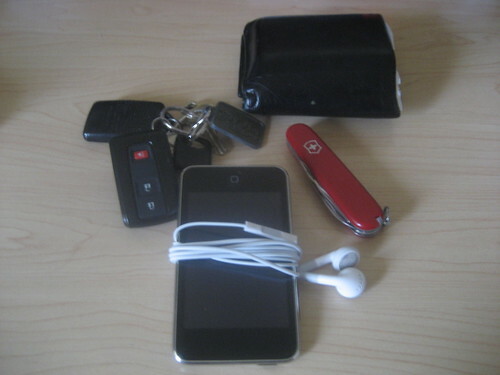 The four most important items – the ones I find myself turning to several times a day – reside in my pockets, not in my messenger bag. These essentially boil down to four items. Keys I keep my keychain simple – just the key/car opener for each of the two vehicles we own, the key to my own house, and the key to my parents’ house. I have several other important keys, but I keep them locked away at home to reduce pocket bulk. Wallet It’s where I store receipts and keep my drivers’ license and a small number of other cards. I’ve discussed in detail how to organize the items in your wallet, and I still stick by those principles. Swiss Army Knife I received this as a Christmas gift a few years ago, and it serves me well – I specifically carry the Spartan model, which is minimal in size but also minimal in tools. It does include the three things I use most often – the corkscrew, a basic blade, and a bottle opener. I used to carry a Leatherman Wave, but it was right on the fine line of being too bulky and it didn’t include a corkscrew, which I consider to be practically essential for a pocket tool like this. Having used both extensively over the last decade, I’ve realized the tool I would actually like to have is the Leatherman Flair, which is basically a “middle” alternative between the two. iPod Touch Prior to receiving this as a gift, I kept a notepad and a pen in my pocket, as well as a voice recorder. This device has replaced both, as I can jot down most quick notes and do quick voice recordings with it. It also takes up less space in the pocket. No cell phone? Honestly, I don’t carry one in my pocket at all times. I usually find it to be a digital leash, enabling people to contact me and interrupt me at the very time I want to escape a little bit. That’s my messenger bag, in it’s typical place by the door of my office so I can grab it whenever I’m ready to go somewhere. The bag itself is a Timbuk2 Laptop Messenger bag made from hemp. I’ve removed the shoulder strap since I virtually never used it and it always seemed to be in the way – I prefer to carry it by the handle. 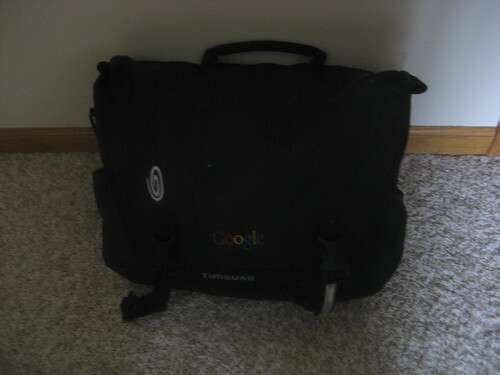 The bag sports a Google logo because the bag was a giveaway item – I didn’t buy it. Likely, I would have just used my old college-era backpack until it fell apart, but since this bag was free, I’m quite happy to use it. So what’s in the bag? I pulled everything out of the bag for the picture above. Here’s what’s inside, starting in the upper left and proceeding downward. Laptop AC adapter This item’s in the upper left and is pretty self-explanatory. The “frugal laptop” I discussed this in the past. This is a rather old laptop that I recently refurbished and installed Linux on. It works perfectly on the road, as the big things I want to do when traveling are accessing the web, answering email, and a bit of light writing. I don’t do heavy duty tasks when traveling, so an older laptop with Linux on it is perfect for my needs. Again, this is an item that’s in there because it’s a great value – reusing an old piece of equipment and finding a great new use for it is a great frugal tactic. A USB “multi-card” reader This little device lets me read memory cards of all kinds, allowing me to easily transfer files. Pens I keep a healthy collection of pens in my bag so that I can jot down notes at any time and I don’t have to worry about one failing. Wireless mouse This is probably the least-used item in my bag. I keep it in there because it’s useful to have when others are using my laptop for some purpose – I prefer the touch pad, but some people hate it. This one’s another freebie, actually. Small notebook Sometimes it’s just not convenient to use the laptop for note-taking or for jotting down very quick notes or for giving people notes of some kind. In those events, I bust out a small notebook like this one. I used to use a full-size pad, but I found this medium-sized one to be more convenient and appropriate for my use (plus they were on sale at a huge discount at a local store a while back – literally pennies each). Nintendo DS / earphones / baggie with games If I’m caught in a situation with fifteen minutes or less of downtime, I’ll usually get out my DS and play a game of some sort. It’s also a surprisingly effective way to connect with some people. Reading materials The rest of my bag is filled with reading materials. An allotment of recent magazines (WIRED, The New Yorker, The Atlantic, Bon Appetit, The Economist, Business Week, and Consumer Reports are all visible) and two books (at this moment, Shock Doctrine by Naomi Klein and if on a winter’s night a traveler by Italo Calvino) can usually be found – sometimes, there will be newspapers and other documents in there, too. Digital camera I also include my digital camera in the bag, so I can take pictures. It’s not in the image above, though … because I’m using it to take the picture. One thing I should be carrying, but am not in this picture, is business cards. I usually keep a handful of Simple Dollar-related cards in the bag, but I happened to be out of them when the picture was taken. So, what’s useful to note here? 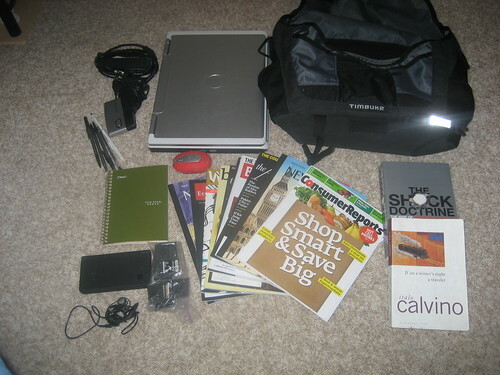 A travel bag doesn’t need to be expensive In the pictures above, most of the pens, the wireless mouse, all of the software on the laptop, and the bag itself were free. The magazines, the spiral notebook, and the paperbacks were obtained for pennies. The laptop itself is reused. The DS, the iPod Touch, the knife, and most of the DS games were given to me as gifts. To put it simply, the bag full of essential items that I carry with me wasn’t a big cash outlay – many of the items were either free (or nearly so) or gifts. Less is more I know many people with bags far, far more overstuffed than mine. Once upon a time, my bag included quite a bit more than this, too. I realized several things, though. First, the more stuff you carry in the bag, the harder it is to find the item you want when you want it. Second, if you’ve got it stuffed to the rims, it’s even more devastating if you lose the bag. Third, an overstuffed bag is much heavier. Finally, an overfilled bag creates a really terrible impression of you on others. Focus on what you actually need to do On the road, I do several things. I do some light research. I do some writing. I go to meetings where I take notes. I answer email. I wait. In reality, that’s about it. So I focus on the materials that make these tasks easier. Other items are unnecessary.